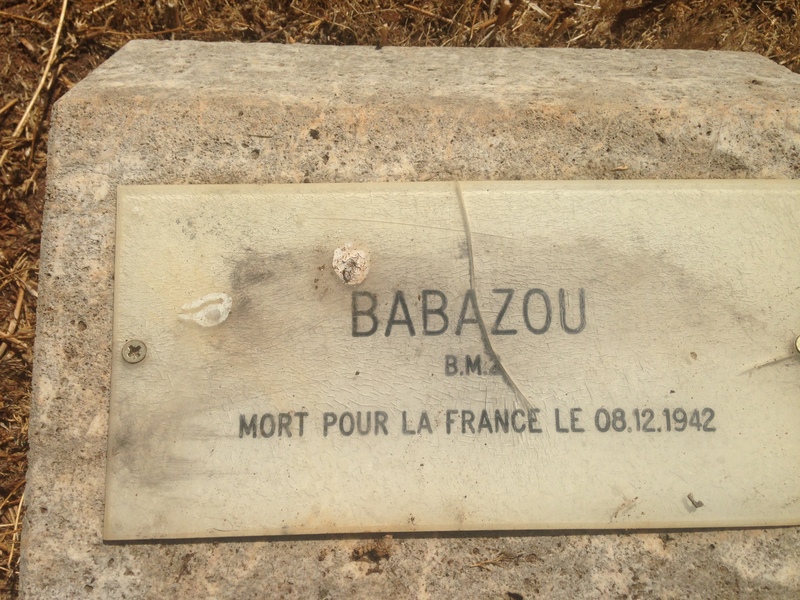 At a cemetery in Beirut, soldiers from the French colonial army--including the Senegalese triailleurs--lay buried. Little is known of the cemetery, let alone of these soldiers’ lives. The cemetery does not appear on any map of Beirut, and the soldiers’ presence does not figure into official Lebanese history-telling. Indeed, the cemetery contains dead memory—memory that has been buried or erased from public discourse. I am here on a hot summer day. Although decorated with pine trees and white gravel stones, the site evokes a sense of abandonment. There are rows and rows of gravestones, but no visitors have arrived, and no flowers appear on the graves. A solitary caretaker greets me at the entrance and follows me around. Although the site is open daily, not many visit, he tells me. Most days he is alone among the graves. He looks anxious when I take photos of them, and asks if he can dust them off first. Each grave marks the soldier’s name, rank and year of death. The first thing that strikes me are the names — engraved are not “Pierre” or “Henri” but “Abdallah”, “Domkelele” and “Nguyen”. 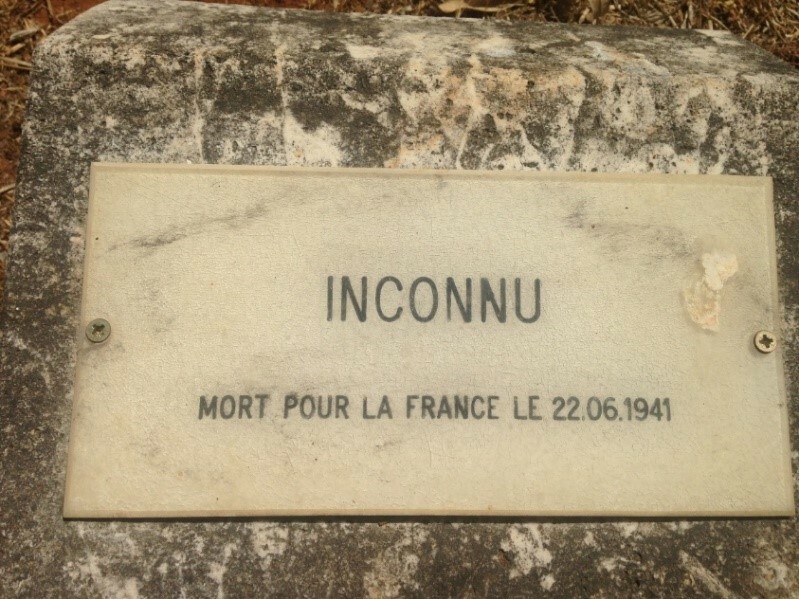 Many are designated “mort pour la France.” Some are simply marked “inconnu.” The soldiers’ deaths span from 1918 to 1945, implying two world wars and the French Mandate era in Lebanon. The cemetery is divided into a Christian and a Muslim section, separated by a street, which contains 1212 and 851 tombs, respectively, along with a few collective ossuaries. Next to the Muslim section are two smaller sections, one “Indochinese,” with thirty-two tombs and two very large collective graves with the remains of 150 soldiers, and one “African,” with thirty-eight tombs. According to information obtained from the French embassy, the “African” section is designated “agnostic.” I assume from this that the section contains bodies that could not be categorized within any of the main religions. These categories appear intermixed in any case, since there are many ‘African’ names in the Muslim and Christian sections, as well. Since the gravestones all look the same, the soldiers’ different religious and ethnic identities, marked by crosses and moon crescents, are visible only upon close inspection. The cemetery is not easy to find, tucked away on a side street, in the shadow of the Horsh Beirut pine forest, an area marked by tensions over access and ownership associated with the continued military presence of the French in Lebanon. Inside Horsh Beirut, the only public green space in the capital, the French Ambassador sleeps and hosts parties at the Sursock Palace. During the Mandate, France housed the high commissioner there, having bought the palace from the Lebanese Sursock family in 1921. After Lebanon gained independence in 1944, the French renewed the lease. During long-winded reconstruction of the Horsh park after the Lebanese civil war finally ended in 1990, the park remained closed to the public, yet access was still granted to French and European visitors. After years of Lebanese protesting this unequal treatment, the park was opened to everyone in 2015. Contrary to the many daily struggles in Beirut over public space and infrastructure fought largely across sectarian lines, this struggle took a distinctly postcolonial tone, one in which residents protested the continued practice by the French of distinction and privileged access on Lebanese sovereign ground. I notice the plastic bottles lying in the corners of the cemetery. “The neighbors are throwing trash in the graveyard,” the caretaker tells me. “We notified the French Embassy, and they have tried to call them, but what can we do? People don’t care about the place.” In her discussion of the lack of postcolonial debate in French public discourse, Ann Stoler argues that France suffers from “colonial aphasia”, which she understands as a process of occlusion or displacement of the known. It is not that France has forgotten its colonial past; rather, aspects of this history have been displaced and dismembered (Stoler 2016: 128). Similarly, the cemetery evokes a sense of displacement. This is substantiated not only by the cemetery’s spatial placement within the life and history of Beirut, but also in the French state’s treatment of the site. When I contacted the Embassy, it took a week of correspondence for them to finally deliver a response, which itself was hardly satisfactory. They could not even tell me what year the cemetery had been established. Several layers of memory are buried at this site: the Lebanese public memory of the French colonial past, including the presence of colonial troops; the tirailleurs’ own undocumented memory of this experience; and the French state’s selective memory of its colonial legacy. This occlusion of the known is most visible in the French state’s continued commemorative practice at the site. 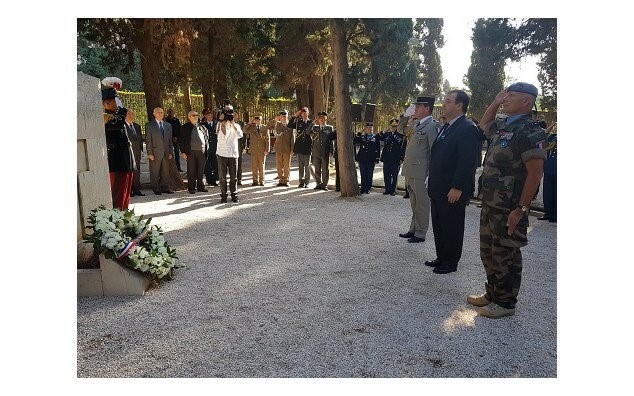 Every year on November 11, the French Embassy in Beirut commemorates the 1918 armistice of the First World War. 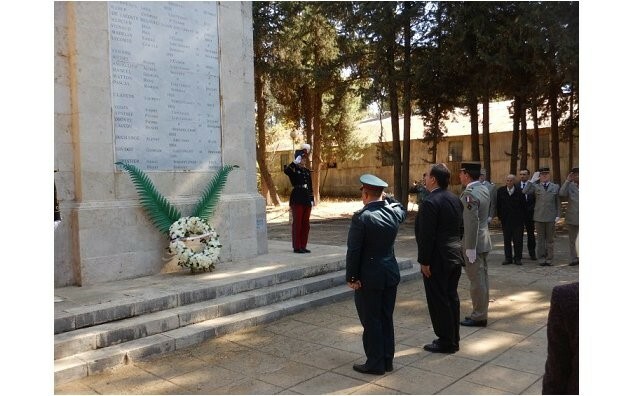 At this ceremony, the French ambassador, flanked by Lebanese army officers and French expatriate notables, honors the soldiers who died fighting for “la France.” At the commemoration this year, Ambassador Bruno Foucher spoke of the terrible destruction of lives and habitat that the war brought upon the world at large. The ambassador made no mention of the particular destruction and loss of life that the war, with France’s involvement, brought upon Lebanon. Nor did he mention the soldiers who fought this war. The commemoration, which coincides with similar ceremonies in France and throughout the former colonies, is not about Lebanon. Nor is it about the tirailleurs. It is about France. The French ambassador’s speech at the commemoration in November reveals a number of historical erasures. First, in recalling the “victorious” advent of French troops in Lebanon in 1918, the ambassador refashions the French colonial endeavor as an honorable mission of saving the Lebanese. This implied subtext recalls a paternalist and Orientalist discourse familiar from other French colonial battles on Ottoman territory. And second, in stressing that the French troops that entered Lebanon in 1918 constituted a “majority of Levantine troops,” the ambassador managed to restage the conquest as a partnership—an image supported by the presence of Lebanese officers at the ceremony. Contrary to the ambassador’s image of a united French-Lebanese front, the French ruled their Mandate with a hard military hand and was repeatedly challenged by revolt. The Army of the Levant, averaging 30,000 troops and peaking at 100,000 during World War II, included over ten thousand tirailleurs sénégalais, the largest single contingent of tirailleurs outside of Africa. Parading in the Lebanese town of Zahle in 1920, the French High Commissioner, Henri Gouraud, conjured an image of the Lebanese as “adopted children” of the French empire, a status they would share with Moroccan and Senegalese soldiers who had sacrificed themselves under arms in the name of France (Thompson 2000: 40-41). If the tirailleurs constituted siblings of the Lebanese, this was certainly kinship in the Greek mythological sense, where brother equals enemy. As French troops, the tirailleurs were routinely deployed to quash local protest, and were widely feared among the Lebanese. In the few remaining accounts of this encounter, documented by historian Elizabeth Thompson, Lebanese women recall the Senegalese soldiers as particularly “threatening” (Thompson 2000: 48). A Palestinian-American historian told me anecdotally that his father, who encountered the soldiers as a young student in Beirut in the 1930s, found them “terrifying.” The image of tirailleurs as fierce warriors was entertained in French colonial imagination, and used as a strategy of intimidation both in the colonies and against France’s enemies in war. The Armistice ceremony provides an occasion to manifest France’s imperial-national presence in its desired self-image: as a benevolent and caring paternal leader, who has not abandoned its “adopted children” in the colonies. In a language reminiscent of this paternalism, the Ambassador stressed the important symbolism of armistice and reconciliation in Lebanon today, and iterated France’s determination to uphold these principles in Lebanon’s troubled present. This invocation of France’s commitment to—and management of—peace in Lebanon must be read in the context of France’s long practice of staging military campaigns there through a discourse of paternalism. While a soldier’s burial at a national memorial signifies honor on a general level, the distance of the burial place from their hometown leaves an empty space between the body and the life he left behind. 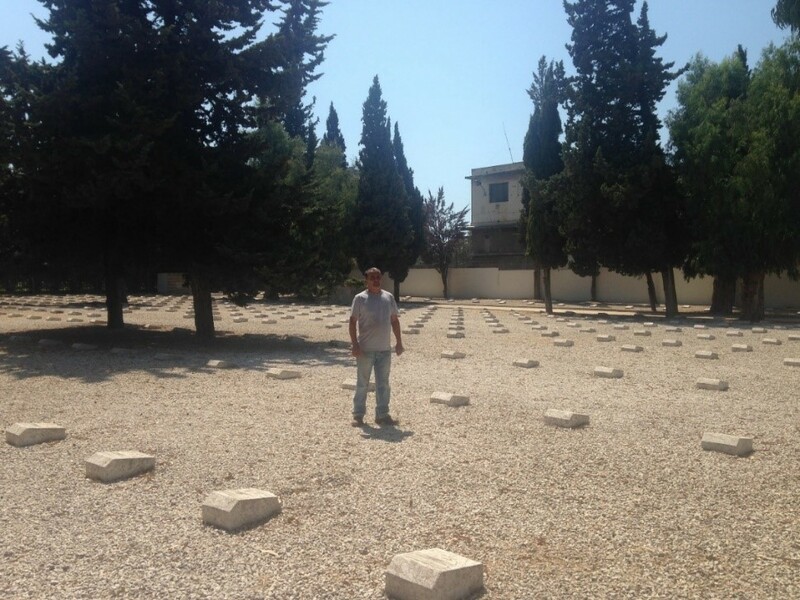 The cemetery in Beirut provides no space for mourning. Instead, the French commemorative practice at this site serves to maintain it as a portrait, literally a still life, beneath which other colonial memories remain buried. To whom does this memory belong? In a note of conclusion, the French ambassador asserted in his speech that “our presence proves that these sacrifices were not in vain.” This is the only point in which he alluded to the lives buried underneath the gravel, and yet even this mention signifies a disavowal. In his generic reference to “these” sacrifices fought at large in the war, the particular struggle of colonial soldiers is erased. While sacrifice is a central concept in battle throughout time and space, whether associated with a national or religious cause, it implies a particular promise of becoming for the colonial soldier. The soldiers fought in the war on condition of difference—a difference they aspired to erase through sacrifice. By giving his blood to the empire-nation, the colonial soldier was promised recognition as a French citizen—recognition which never came. As suggested in Commissioner Gouraud’s speech to the Lebanese assembly in 1921 quoted above the empire-nation relied upon the sacrifice of its subject, its ”adopted child” in the figure of the colonial soldier, to hold its grip on power across the empire. In one of his poems from Hosties Noires, former Senegalese President and ex-tirailleur Leopold Senghor nods to this displacement of French colonial rule onto the body of the sacrificing soldier: ‘Passant, ils sont tombés / fraternellement unis / pour que tu restes / Français’ (“Passer-by, / they fell / fraternally united / so that you may remain / French”). While Senghor here reiterates the notion of a shared struggle, the addressed “you” leaves a note of ambiguity. Colonial brothers are not sacrificing for France in the aspiration of a shared becoming, but in the knowledge that their efforts guarantee that France can remain French; a process that relies on the routine sacrifice of others. 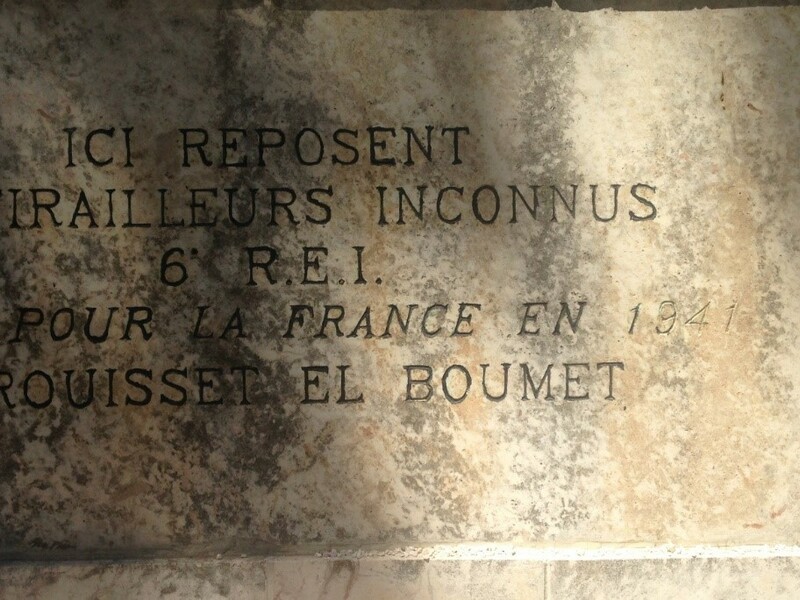 That the poem has been inscribed on a memorial for colonial soldiers in Frejus, France, suggests that its critical subtext has been left untreated. As a sacrificed body, the colonial soldier is dispossessed; his body belongs not to himself but to the French imperial nation. In being commemorated as “French troops,” the tirailleurs are at last paired with their French colleagues. Yet this recognition comes at a price. In the generic commemoration of the French troops, the category of tirailleur, which conditioned their lives in the barracks and on the frontline, is erased from memory. We are reminded here of Stoler’s concept of aphasia. The French state lacks the vocabulary by which to speak of its colonial past in direct terms, or the clear sight through which to look at it. Rather, when the topic broaches the dark sides of its colonial legacy, the French state speaks in generic phrases or looks sideways. The colonial burial ground in Beirut, and the ambassadorial commemoration of it, signifies this displacement of memory, in which little is said, and what is said is not what is known. Imperial formations linger in France’s continued practice of exclusion and erasure in their handling of dead matter. 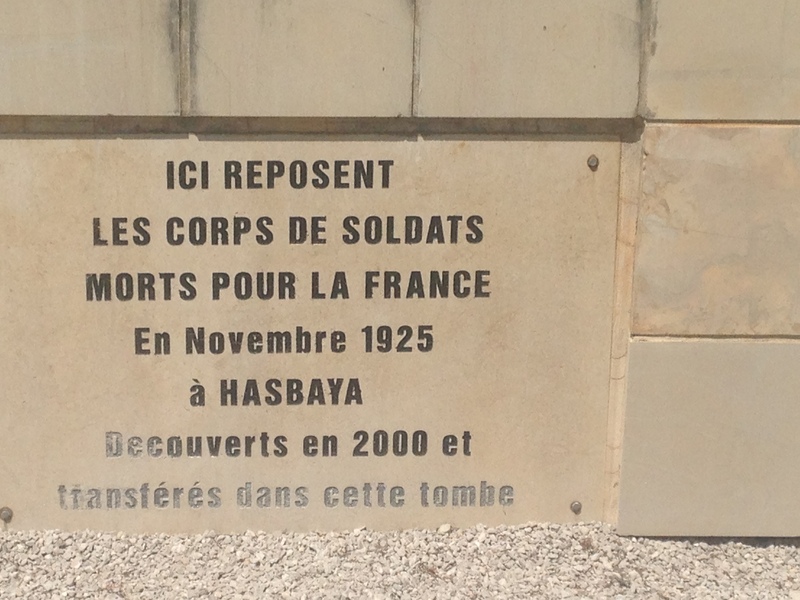 In 2000, the French uncovered the remains of soldiers killed in battle in South Lebanon in 1925. The remains had been found by a Lebanese resident in 1985, who had kept them out of fear that the occupying Israeli troops would confiscate them. According to news reports, the remains were transferred to the cemetery in Beirut and reburied by a priest alongside the French Embassy (Albawaba 2000). That the soldiers were considered Christians calls for pause. Since only their bones along with a few material possessions—such as medals, bullets and shoes—remained of the soldiers, how could the French state be sure that the soldiers were not of colonial origin, in which case they may well belong to a different religious category? The commemoration of the French soldiers as Christians suggests the limits in French commemorative practice of uniting the troops under one flag. This recalls Senghor’s poem, quoted above: “Passant, ils sont tombés / fraternellement unis / pour que tu restes / Français.” In the commemoration of French troops, the tirailleur is called “French.” He may once have carried a different name, but it is now forgotten. He remains unknown. Ann Stoler, “Colonial Aphasia: Disabled Histories and Race in France”, in Duress: Imperial Durabilities in Our Times (Durham: Duke University Press, 2016). Elizabeth Thompson, Colonial Citizens, (New York: Columbia University Press, 2000). Anna Reumert is a doctoral student in Anthropology at Columbia University in New York.